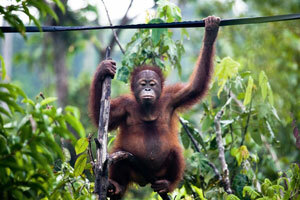 ‘Orang-hutan’ literally means ‘Man of the Forest’ and little wonder. 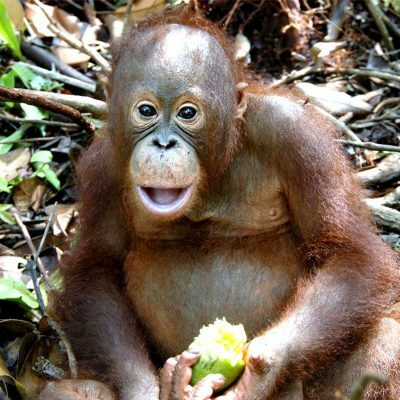 Orangutans are part of the great ape family, so they tend to be larger and heavier than monkeys, even though they are both primates. Great apes also have a bigger brain and can use tools, such as sticks, to help them get food to eat or leaves to make a sunshade or umbrella. Orangutans live in Asia and are found on the islands of Borneo and Sumatra, living in lowland and hilly tropical rainforests. They are regarded as an ‘umbrella species’, which means they are pivotal in creating the necessary environment for the thousands of fauna and flora that make up the biodiversity of the South East Asian rainforest. 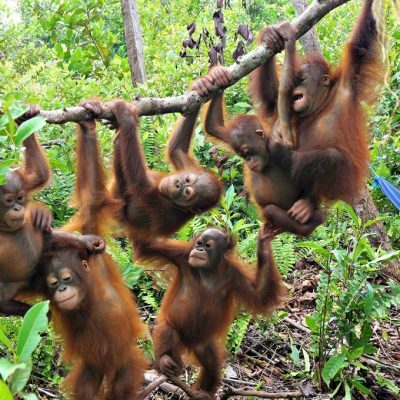 Its arboreal tree-swinging journeys help to spread tree seeds – in fact, some trees can only germinate when they have passed through an orangutan’s gut. Pongo pygmaeus pygmaeus is the most endangered species of the Bornean orangutans with an estimated population of between 1,500 and 3,500 individuals. They are found in Western Kalimantan and also in Sarawak. Pongo pygmaeus morio is found in the North East around Sabah and East Kalimantan, with a population estimated between 8,000 and 18,000 individuals. Pongo pygmaeus wurmbii is the Central Kalimantan subspecies and the most plentiful with up to 40,000 individuals. 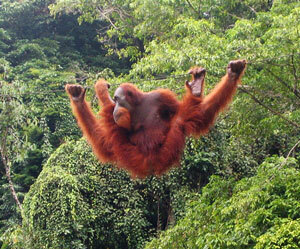 The Sumatran orangutan is smaller than its Bornean counterpart and has a longer face and lighter, longer coat. The newly discovered species of orangutan, the Tapanuli orangutan, has a smaller skull than the Bornean and Sumatran orangutans, but has larger canines. Mature males have cheek flanges similar to those of Bornean orangutans, but their slender build is more alike to Sumatran orangutans. 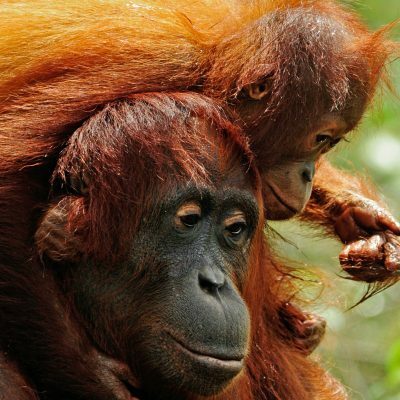 Their hair is more cinnamon in colour than the Bornean species, and the Batang Toru population also makes longer calls than other orangutans. Homo – which includes modern humans and extinct relatives and ancestors such as the Neanderthal.